Exotic fruits of Hawaii on display. 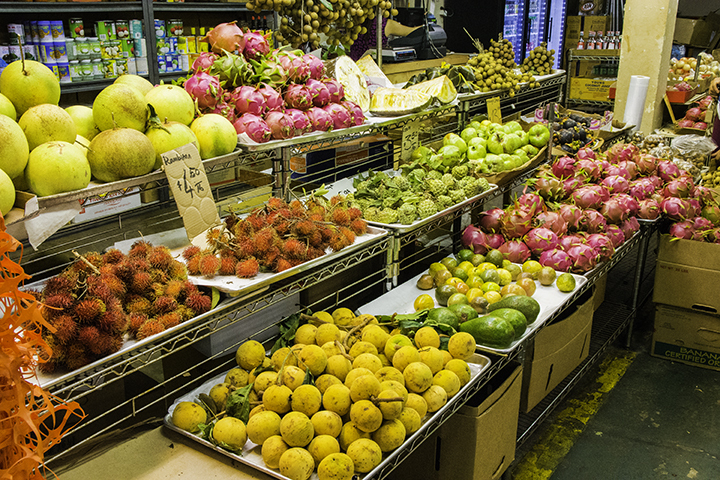 When you think of the Aloha State, many think about the exotic fruits of Hawaii and the foods you can eat. Almost everyone knows you can enjoy coconuts, pineapples, guavas, mangoes and papayas in the Aloha State. But there are actually even more exotic fruits of Hawaii than those. For example, many aren’t aware of an oval fruit with five distinctive ridges resembling a star. Quite naturally, people call it a starfruit. Others know it as the carambola. In addition to Hawaii, you can find it in areas like the Philippines, Indonesia, Tahiti, Guam as well as in South America and the Caribbean. It has a waxy exterior and turns yellow when ripe and has a juicy semi-sweet tart taste. 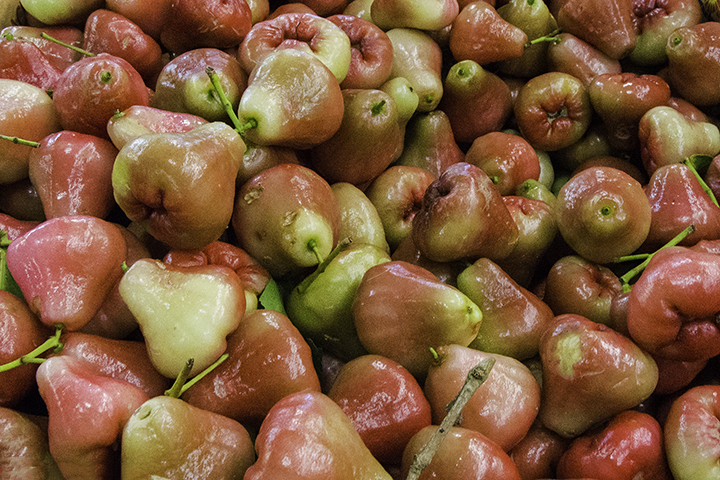 Another local delicacy is the mountain apple. While red in color, it’s really not an apple and it doesn’t really look like an apple. In other places, people call it a Malay rose apple. The Hawaiian name for this fruit, of the syzygium family of flowering trees, is ōhiʻa ʻai. The fruit is referred to as a canoe plant because it was originally brought by the ancient Polynesians who originally sailed to Hawaii by canoe. Unlike regular apples, it does not have a crunchy feel when you bite into it. Instead, it has a softer, but still very succulent sweet taste. There is also the breadfruit. People call it that because, in Polynesia and other tropical climates throughout the world, they eat like a staple. Polynesians eat breadfruit like Europeans eat bread and Asians eat rice. 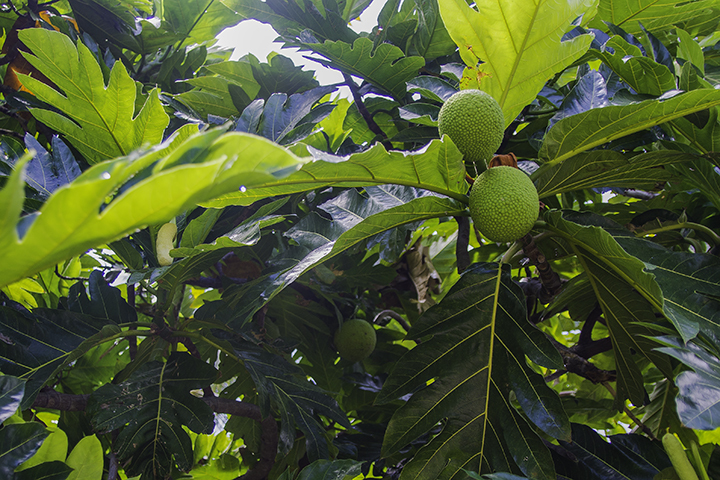 The breadfruit grows on a tree from the mulberry family and one can find it throughout Asia and the Pacific. And like bread, you will have to bake the breadfruit in order to really enjoy it. One of the local favorites is the apple banana. Yes, you can get bananas practically anywhere. But you can’t get apple bananas everywhere. Farmers grow apple bananas in many places in Hawaii. Once you see and eat it, you’ll immediately see the difference. The apple banana is shorter and has a more tart like taste than a regular banana. Most locals prefer the taste of the apple banana over the regular banana. You might too. Unfortunately, you probably won’t be able to find these exotic fruits of Hawaii at the larger local supermarket chains. Your best bet is to find them at the many local farmers market throughout the state.